At the corner of Dundas Street West and McCaul Street in downtown Toronto, I meet homeless artist and Type A diabetic Umar Dechert (pseudonym). In northern Ontario, his outdoor jobs had included everything from building homes and growing vegetables to clear cutting and blowing up beaver-dams. Dechert could no longer work because he could not reliably get to job sites after the town doctor took away his driver’s license due to reoccurring black outs caused by his medical condition. “Without a car, it’s the bush, there’s no TTC. You’re forced into the city. You can’t drive without a driver’s license. I don’t have the jobs here like I did up there, so I lost everything I had. Twenty years of work gone,” explains Dechert. He was pushed from an independent life in Burks Falls to the fringes of Toronto society, his goal now is to become one of the best landscape painters in Canada. But finding an open door into the established world of art often requires the perfect storm of training, contacts and marketability. The art world includes the interconnected activity of connoisseurs, curators, galleries, dealers, critics, academics and the artists. Sociologist Harold S. Becker described it as the “network of people whose cooperative activity, organized via their joint knowledge of conventional means of doing things, produce(s) the kind of art works that art world is noted for.” Despite taking some informal classes in the Dadashi Galleries, 3417 Yonge Street, there is no denying the status of Umar Dechert as he stands outside the AGO selling his own art in the middle of winter. Inside the AGO, hangs a piece by American pop artist Andy Warhol (1928-1987) of Elvis Presley transposed on a grand canvass four times, his bright colours fade, left to right, red and blue to shades of grey. The images are appropriated from a promo-still of 1960 film Flaming Star, in which Elvis plays the part of a half-Kiowa/half-Texan gunslinger, finding himself outside two worlds when a local Kiowa tribe starts raiding local white homesteads. Dubuffet believed that forms of societal conditioning imposed upon the formally trained artist, such as studying the ‘masters’ works and mimicking their techniques, had the effect of making art increasingly layered and derivative products i.e. cooked art. He helped popularize an idea that art should be raw, a direct expression of the artist’s internal disposition. 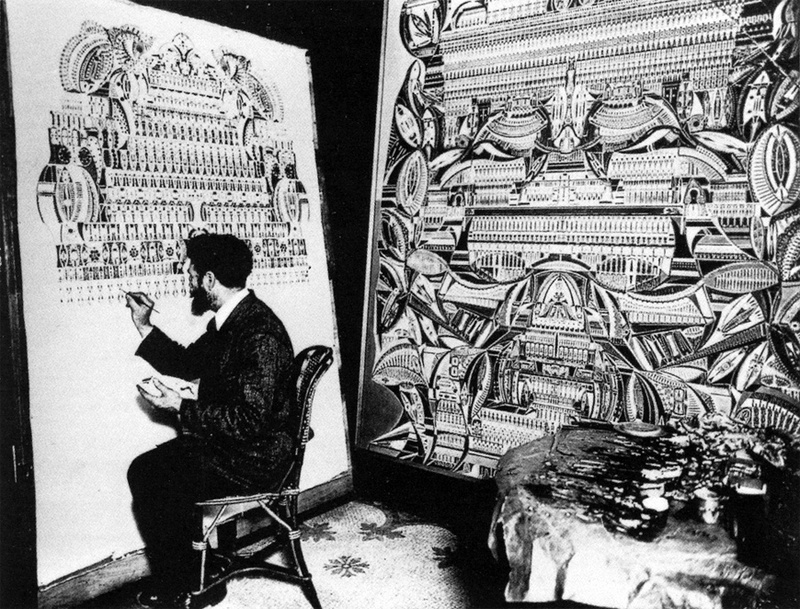 Legend has it that in 1911, with no formal training, and no connection to the art world, Augustin Lesage (1876-1954) began work on a painting inspired by a most unique source. He claimed that spirit voices guided him through every step of the creative process. In technical terms, First Painting is in the precise style of a miniaturist on a ten-foot square canvas. In a poignant display of irony, Lesage signed the work Leonardo Da Vinci, who he claimed had been a spirit guide. The work and the story of its creation serve as an example of the transcendent possibilities of art, especially when created outside the confining sphere of the art world, of internal necessity, not to please nor to make money. The year 1948 saw the opening of le Foyer de l’Art Brut (Art Brut Center) in the basement of the Place du Vendôme gallery in Paris, France. 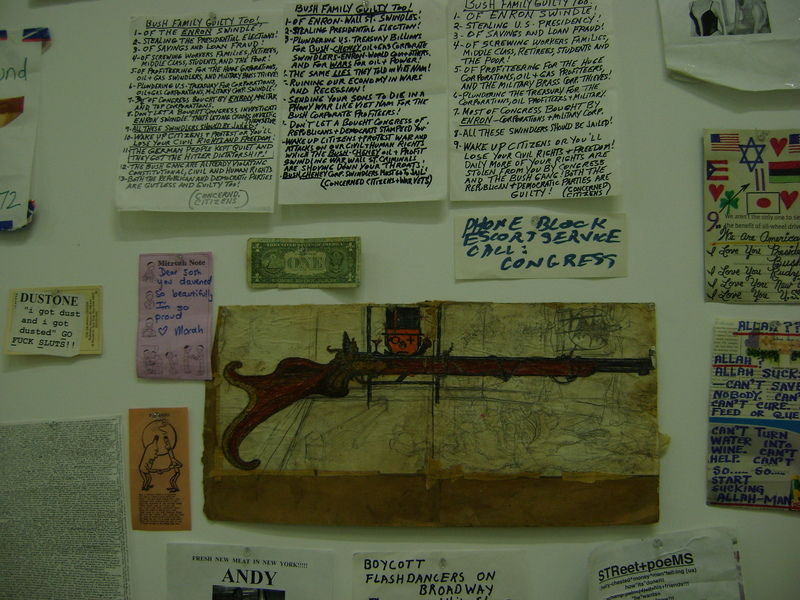 The collection consisted of work by schizophrenics, paranoids and prison inmates. By 1962 it had expanded to include work by an untrained cobbler, pastry cook, postman and that most unusual coal miner Augustin Lesage. According to Thévoz, “his pictures were increasingly influenced by the Institut Metaphysique in Paris, with which he became closely connected, gaining some measure of recognition as a medium and an artist.” Dubuffet’s view that the art world had negative effects upon art rang true when the work of Lesage lost its raw creative quality as it gained recognition. Lesage had shifted from outsider to insider. History shows that the underpinnings of what has been labeled Outsider Art in North America, owe much to Dubuffet’s promotion of art brut in the United States between 1951 and 1962. Other early 20th Century European art movements such as: Dadaism through brash rejection of the art establishment, Surrealism through experimentation in automatism and creating under altered states of consciousness, and the collection of the works of the insane by Swiss psychotherapist Dr. Hanz Prinzhorn, spurred the original need for an art brut collection. The societal status of Dubuffet, a trained artist with connections to the art world, put his art outside of his own art brut criteria. Outsiders influenced his work and he trumpeted theirs, but Dubuffet could not, in the truest sense, derive his inspiration from an unfettered source to the same degree that the artists in his collection could. One might liken him to an intermediary between the art world and certain artists far outside of it. Analogous relationships exist today between outsider artists and the murky artistic status of those trained artists that help get them recognized. The Mercer Union, 1286 Bloor Street West, recently held an exhibit by Kenneth Goldsmith, who, like Dubuffet was formally trained, but displays the work of outsiders like David Daniels, who spent dozens of years secluded in a Berkeley cottage, where his pictorial poetry took such forms as a squirrel or an ice cream sundae via an ancient version of Microsoft Word. Goldsmith has appropriated to the gallery space an overwhelming mélange of political statements, street confessionals and scribbled rants from the streets of New York City. Like Dubuffet in his day, Goldsmith is a collector. His most definitive curatorial work is the collection of avant-garde and outsider art, poetry, music and sound recording on UbuWeb. Mercer Union gallery attendant Lyndsey Cope says “outsider artists are people, who are a bit different maybe mentally or physically. They are people and artists as much as we are, but they are categorized as having a mental disability like Down-Syndrome.” Cope refers to outsider artist Judith Scott, creator of complex sculptures of yarn wrapped around various inanimate objects. Ross Patchell, the aging hippy owner of Off the Wall Art and Framing Gallery, 450 Queen Street West, follows the famous mantra “art for art’s sake,” thought to be coined by French Romantic virtuoso Theophile Gautier sometime in the 19th Century. “Art is art,” Patchell declares. “If there is outsider art, does that mean there has to be insider art? And who gets to decide? Whoever thinks that should be shot.” I’ve disrupted Ross’ peaceful day – he tells me as much – with perturbing questions: where does the line between insider and outsider art lay, or lie for that matter? Should it matter? What is outsider art outside of anyway? 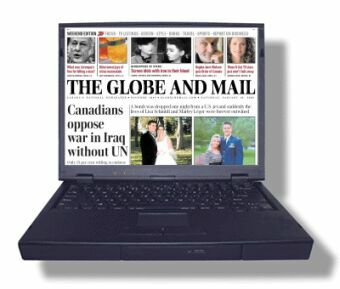 Gallery | This entry was posted in Canada, Feature writing and tagged AGO, Andy Warhol, Augustin Lesage, Berkeley, Burks Falls, Canada, Dadaism, Dadashi Galleries, Elvis Presley, France, French, Jean Dubuffet, Kiowa, L'Art Brut, Le Foyer de l’Art Brut, Mercer Union, Microsoft, New York, Northern-Ontario, Outsider Art, Place du Vendôme, Surrealism, Texas, Toronto, TTC, Umar Dechert, United States, Yonge Street. Bookmark the permalink.